latest reports suggest that OnePlus 2 is currently being tested for the latest Android 7.1.1 Nougat OS. The phone has made a stop on Geekbench with v7.1.1 of Android Nougat running the show, but this doesn’t give us any dates as to when the OTA update will start rolling out. 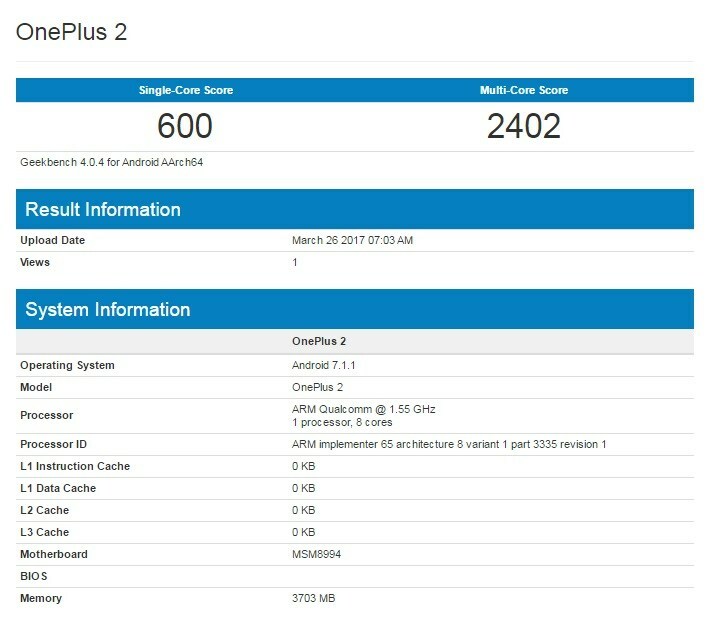 Looking at the specs Qualcomm Snapdragon 810 SoC and 4 GB of ram of OnePlus 2, there’s no doubt that the phone qualifies for the Nougat update as Nexus 6p And Xperia z5 are of same category and are updated to Nougat. Geekbench listing doesn’t guarantee that an update to Android Nougat on OnePlus 2 is here. But there is a hope that oneplus is getting ready for official Nougat update for oneplus 2. To stay tuned, stay connected. My name is Pankaj Joshi and i am a full time blogger and author of yournexttech.com. I am not at all good at talking about myself but ill give it a shot. I love gadgets/electronics, music, troubleshooting and running. Yes i said running and i proudly carry Six medals in half marathons and still counting many to come in future. OnePlus 6 next to Iphone X, OnePlus 5T ??? Oneplus 5T unboxing video before the Official launch ?? ?